Pewter City offers few attractions, but none as important as the Pewter Gym! At last, you can begin to take the Gym Badge Challenge and ultimately face the strongest Trainers in Kanto! While inaccessible for now, the museum at the north of the city also holds some secrets that are sure to aid you in your quest to become the Pokemon Master. In Pewter City, you will fight Brock, your first Pokémon Gym Leader. You won't be able to advance further into the game until you beat him, so make sure to visit the Gym as soon as possible. If necessary, build up the experience of your own Pokémon by having battles in the wild. 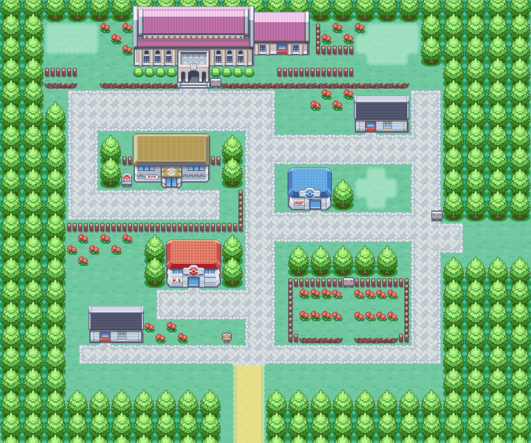 Before you do either, visit the Pokémon Center in Pewter City, so if all of your Pokémon faint in battle, you'll resume your journey there instead of far away in Viridian City. The Easiest way to defeat Brock with Charmander as your starter is by using Mankey. It learns the Fighting type move Low Kick at level 6, which will take down Brock's Pokémon in one or two hits since Rock type Pokémon are weak against Fighting type attacks. A Mankey can be caught on Route 22. Another way is to level Charmander up so it can win the fight through superior strength. At level 13 it learns the Steel type move Metal Claw, which is super effective against Rock types. Note that Rock type attacks are super effective against Fire type Pokémon so make sure you're stocked up on potions first. Critical hits can happen any time, so heal often! Another way to deal with Brock is to catch a Caterpie in Viridian Forest and evolve it to Butterfree so that it learns Confusion, a Psychic type attack. Though it isn't super effective against Rock, it still does high damage since Geodude's and Onix's Special Defense stats are very low. Note however that just like Charmander, Butterfree's Bug/Flying type is weak against Rock attacks. The downside to this plan is that Butterfree isn't going to be very useful later in the game, so unless you're trying to fill your pokedex, leveling up a Caterpie isn't a great use of your time. Once you defeat Brock, he'll give you TM 39 which can teach a Pokémon the Rock Tomb attack technique. He'll also give you his Boulder Badge, which grants your Pokémon a small power boost and allows you to use Flash(once you have HM 05) outside of battle. Additionally, you will get a TM/HM Case, which allows you to store your TMs and HMs without occupying any more space in your gear bag. Once you do have Cut, you'll get the Old Amber from a scientist who is interested in extracting Pokemon DNA and will ask you to take it to a research institution. In addition, one of the other scientists is a Move Tutor that will teach one of your Pokemon Seismic Toss! This page was last edited on 2 October 2017, at 03:29. This page has been accessed 334,532 times.